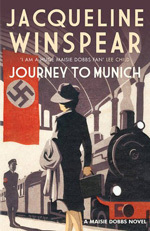 In this Maisie Dobbs novel, our hero is sent to Munich as an undercover agent. Her task is the bring an important inventor back to England, releasing him from the clutches of Nazi ruled Germany. Posing as his daughter, she must convince both him and his jailers that she has the authorization to release him from Dachau, the prison near Munich. Just before leaving, the father of the woman whom Maisie blames for her late husbands death, persuades Maisie to seek out his daughter who also is in Munich. Munichs beauty and the seemingly ordinary life of its citizens mask the tensions and darkening mood caused by the increasing suppression and watchful eyes of the Nazis. Supporters of the rise of the Nazis in both England and Germany are noted, as is the sense that most Germans were nervous about their power. The invasion of Austria occurs while Maisie is in Munich. Woven into the story are Maisies reflections on her past life journeys as well as her present state. Is undercover dangerous work just the push she needs to overcome her unease about her feelings of being in limbo? Can the teachings of her deceased mentor Maurice help her in this situation?